INDIA - India is a magical place that I have had the opportunity to visit on numerous occasions. My first trip was on assignment for the fashion magazine Mirabella to travel concurrently with the novelist Susanna Moore, and we would both give our impressions of India. We began our journey in the southern city of Cochin and worked our way north. Once we arrived in Delhi I was on my own, so I planned a trip to Agra where the famed Taj Mahal sits majestically on the banks of the Yamura river. On the way I stopped off in the bustling town of Vrindivan, the birthplace of Krishna. While walking down a narrow alley I heard a large group of women chanting and looked for an entrance, following the sounds. 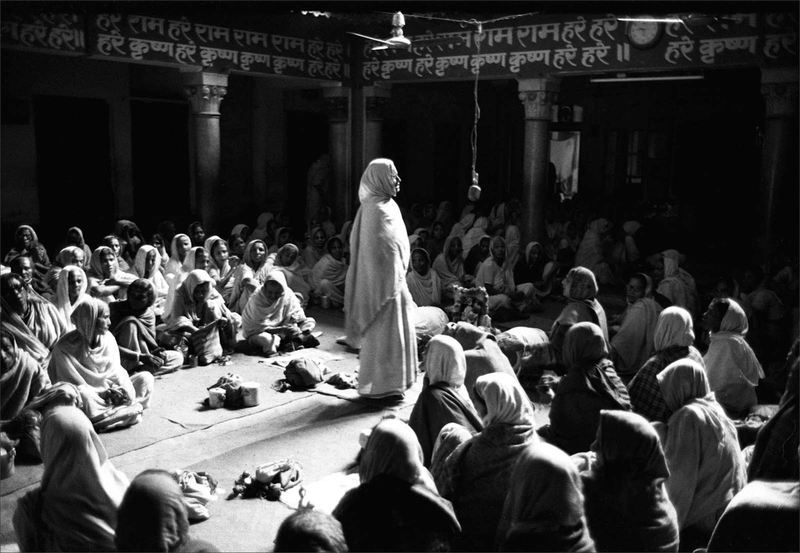 I turned into an inner covered courtyard, walking into a scene out of a dream – hundreds of Krishna Widows were following their leader in song.